The planned reconstruction of the Hungarian section of the Budapest-Belgrade railway is being delayed again. If finished, it would be the first huge Chinese infrastructure project within the European Union. However, it is being postponed again after the Hungarian government announced that the public tender for the project would be repeated because the estimated costs of the reconstruction went up again by more than 10 percent. As VSquare reported last year, the proposed railway reconstruction is part of Chinas’s Belt & Road Initiative. Beijing already bought the port of Pireus in Greece and needs a railway line to transport goods into the heart of Europe. To this aim they need the Budapest-Belgrade railway line reconstructed, and it seems like Hungary is willing to do its part. It is going to cost the Hungarian taxpayers a huge amount of money. The government in Budapest is planning to take a Chinese loan in order to be able to finance the project. It will be constructed by a consortium wherein Chinese companies have an 85 percent share, and in the end the railway will be primarily used by the Chinese because there are no major Hungarian towns along the railway. According to the plans, the railway will be modernized, and the single-track line will be turned into a double-track line. The Budapest-Belgrade railway line is 350 kilometers long, out of which Hungary has 166 kilometers and Serbia has 184 kilometers. The project is going very slow, and some experts doubt that it will happen at all. The Chinese, the Serbian and the Hungarian prime ministers agreed in November 2013 to reconstruct the railway line. After significant and regular delays, Hungary announced the public tender for the reconstruction and expected to announce a winner for the job at the end of 2018. Instead, the Hungarian government decided that it would repeat the process because both offers were too expensive. The submitting consortiums consisted of both Hungarian and Chinese companies. Their names are ‘CRE Konzorcium’ and ‘STRABAG-CCCC 2018 KONZORCIUM.’ The names of the companies included in these consortiums were not announced – they are still unknown. The delay was first reported by the Hungarian state-funded news agency, MTI, and was soon confirmed by a government spokesperson. The Hungarian government announced that in May 2018 it had estimated the cost of the railway reconstruction to be 578 billion Hungarian forints (approximately 1.8 billion euros at today’s exchange rate), but neither of the offers it received were below 693 billion forints (2.16 billion euros). The government was not willing to pay the higher price, thus the process will be repeated. This means that the reconstruction will not be started this year but in 2020. 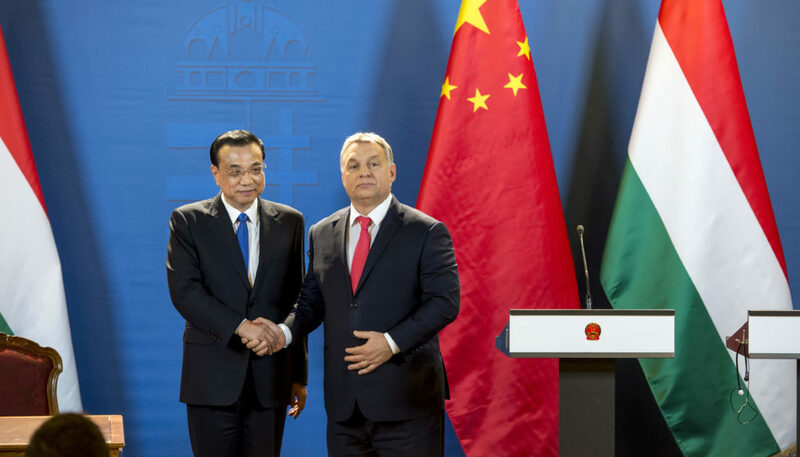 Moreover, news reports and words of the Hungarian minister of foreign affairs and trade Péter Szijjártó suggest that the Chinese loan to Hungary for the railway reconstruction is also not a done deal yet. There has not been an agreement about the terms of the loan; negotiations are still ongoing. Not even the financing has been secured yet. The project has been controversial from the very beginning. It is a railway line that does not serve any major Hungarian towns or industrial centres. This means that at this point it is only China that benefits from the reconstruction. However, Hungarian taxpayers are expected to foot the bill: China is giving a loan, but the state of Hungary is eventually paying for a project that will, according to one estimate, turn profitable in 2400 years (two thousand four hundred years). Railway and transport experts point out that it does not even make sense from the point of view of China, neither. Goods travel from China to the port of Pireus for weeks. Then they are transported towards Europe by railway: the reconstruction of the Hungarian section of the Budapest-Belgrade railway will only cut transportation times by a few hours. Experts who talked to VSquare about this topic last year said that as soon as Chinese politicians or businessmen realize that a project that they were planning would not be profitable for them, they back out. However, there are no announcement of the cancellation usually: they just keep silent and let the project fade into distant memory. The Hungarian government is not back down despite the delays, the costs and the fact that not even the financing of the project has been secured yet. At the end of January the government of Hungary appointed a minister of innovation and technology László Palkovics as government commissioner for the railway reconstruction project. According to the announcement in the official journal of the Hungarian government, Palkovics will be responsible for the ‘legal preparation’ of the reconstruction works, referring to possible new laws that will need to be passed in order to finish the project. He will also need to coordinate between the nations, companies, ministries and departments that take part in the project – and will do this in the next two years without any extra pay.